There is a refreshing impatience about the new chief executives leading the game of golf. Within a week of European Tour boss Keith Pelley making clear he wants to fight slow play, his counterpart at the R&A, Martin Slumbers, was holding a St Andrews conference on the issue. There is broad agreement that the sport needs to speed up and it seems the authorities appreciate the tone can be set by the professional game. There were a number of fascinating revelations emerging from the two-day Royal and Ancient pow-wow hosted by the governing body's head of rules David Rickman. 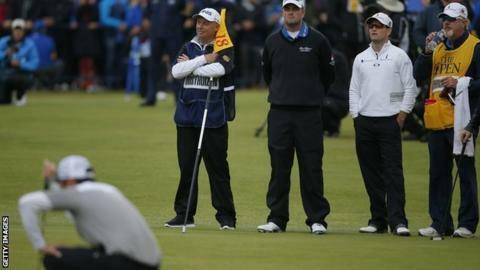 It was revealed that 24 slowcoaches have been penalised shots in the history of the European Tour, among them Severiano Ballesteros, Jamie Donaldson and Nicolas Colsaerts. There have been no such penalties imposed in the last two years though which is being interpreted as a sign that the message is getting through. However the Masters and US Open winner Jordan Spieth nearly fell foul of slow play rules during the third round of this year's Open at St Andrews. The young American and playing partner Sergio Garcia were told to speed up by referee Kevin Feeney after falling out of position with the rest of the field. "Sergio made an effort," the European Tour official revealed. "On the ninth tee I said 'thank you Sergio for your efforts, but Jordan you have made no effort whatsoever, so you are on the clock'." The intervention had the desired effect in every sense. "When he was on the clock, Jordan went birdie, birdie, birdie and he came over and thanked me after saying it was effectively the kick he was needing," Feeney added. There are, though, several players who employ different modes depending on whether they are being timed. As soon as officials turn their attention elsewhere they slip back to their more familiar sluggish ways. This is not only selfish but a form of cheating and it is why I would like to see referees with every group at top professional events. There is surely enough money in the game to pay for the officials and, if not, find a watch sponsor to pay for them because they would play a vital role in timekeeping. Swift rulings would allow matches to continue without delay with those decisions being final, just as in other sports. There should be no time for second opinions to arrive on a buggy while you are trying to entertain and engage millions of viewers. A normal golf hole will take a group of professionals around 10 to 15 minutes. This is why courses schedule tee times every 10 minutes. This equals an 18-hole round of three and a half to four and a half hours. On a very busy course, players could wait as long as five minutes on each tee box before starting the hole. Adding this on top of the normal 10 to 15 minutes of each hole can make a round as long as five and a half hours. Scottish Ryder Cup player Stephen Gallacher told the conference that he would like to see a system of random spot checks on timings. He says it would "create a little bit of fear." He also revealed that he has played in America with a golfer who carries a cheque book with him so that he can pay the fines he is happy to collect. Whenever I have discussed slow play with leading stars and officials there is strong agreement that the imposition of scorecard penalties is the only way to create an effective deterrent. Players develop pre-shot routines that leave nothing to chance. This is often down to the influence of mind coaches who seek to create the ideal mental state for every shot. They are given trigger points at which they turn on their game faces. This might be the moment they put on their golf glove - a first move in an elaborate routine designed give them the best chance of hitting the perfect shot. Never mind that they could have slipped on their glove while walking down the fairway and be ready to hit as soon as it becomes their turn. This is a bugbear of Ryder Cup winner Ian Poulter and former world number one Luke Donald has also been outspoken against rivals who manage their on-course time inefficiently. But there are many ways in which golf can speed up. Gallacher questioned why golfers should be allowed five minutes to find lost balls. "Why can't it be three minutes?" he asked. The way courses are presented has a role to play. There is a macho belief among players at all levels that deep rough and penal setups make for great golf when nothing is further from the truth. Aside from breeding a one dimensional "hack and hope" form of the game it makes for a miserable time spent searching for balls rather than enjoying the game. Quoted in the Scotsman newspaper, Stuart McColm, the course manager at the Castle Stuart course near Inverness, said: "We shouldn't be pounding on people hitting bad shots. "A good course architect thinks how to keep you in the game rather than walking with a golf ball in your pocket." There are plenty more aspects to be considered. The prevalence of "green books" to assist reading putting surfaces does nothing for the pace of play. Ultra-fast greens make putting more treacherous and time consuming than it should be. Limit the distance golf balls fly and courses can be shorter, taking less time to walk. Outlawing the practice of caddies lining up their players should be among rule changes aimed at making the game more time friendly. Should we be required to take the flag out of the hole for putts on the green? Why penalise someone for hitting the flag with a shot from on the putting surface? Why not make it simpler to play ready golf? What about making it easier to play out of turn to keep the game moving? These were among the many questions that were put forward at the Time for Golf conference at the home of the game last week. It was the first such gathering to tackle this issue for 12 years and it will result in a pace of play manual being published next spring. Along with the European Tour's avowed intention to eradicate slow play, it is another encouraging step in the right direction.